The Game Developers Conference is almost here! I’m looking forward to giving my presentation soon on “Music in Virtual Reality” (Thursday, March 22nd at 3pm in room 3002 West Hall, Moscone Center, San Francisco). Over the course of the last two years, I’ve composed a lot of music for virtual reality projects, some of which have already hit retail, and some of which will be getting released very soon! As a result, I’ve spent a lot of time thinking about what role music should play in a virtual reality game. During my GDC talk in March, I’ll be taking my audience through my experiences composing music for four very different VR games –the Bebylon: Battle Royale game from Kite & Lightning, the Dragon Front strategy game from High Voltage Software, the Fail Factory comedy game from Armature Studio, and the Scraper: First Strike RPG-Shooter hybrid from Labrodex Inc. In preparing my GDC presentation, I made sure my talk addressed some of the most important creative and technical hurdles facing video game composers working in VR. However, time constraints ensured that some interesting info ended up ‘on the cutting room floor,’ so to speak. So, I’ve written two articles that explore some of the best topics that didn’t make it into my GDC presentation. My previous article focused on some abstract, creative concerns facing video game music composers and audio folks working in VR. In this article, we’ll be turning our attention to more concrete technical issues. Ready? Let’s go. VR games currently focus on binaural audio to immerse players in the awesome soundscapes of their virtual worlds. As we know, binaural recording techniques use two microphones, often embedded in the artificial ears of a dummy head (pictured right). By virtual of the popular binaural recording technique and/or binaural encoding technologies, game audio teams can plunge VR players into convincing aural worlds where sounds are spatially localized in a way that conforms with real world expectations. The technology of binaural sound continually improves, and recently the expert developers of the Oculus Rift VR headset have refined the quality of their VR sound with two significant upgrades. First, they have introduced “Near-Field Head Related Transfer Function.” We’re all probably familiar by now with the concept of Head Related Transfer Function (HRTF), in which sound interacts with our heads, bodies and ear canals on its way to our ear drums. The subtle changes undergone by those sound waves endow them with the specific qualities that reflect the real-life aural world. In the original Oculus Audio SDK, realistic HRTF was limited by distance. Sounds that occurred a meter away or more would reach us with all the correct HRTF effects we’d expect, but when sounds were emitted within that meter-wide diameter around our heads, the HRTF effects would no longer function. So now the Oculus team has introduced “Near-Field HRTF” to fill in that gap. This allows sounds that might occur close to our heads to feel more realistic. Both of these recent innovations depend on the binaural delivery system in order to function. Binaural is currently very important in VR audio, and is likely to remain important for some time to come. In my upcoming GDC talk, I’ll be reviewing the history of the binaural recording method and its importance to virtual reality game development. By virtue of both my own experiences with multiple VR projects, I’ll be describing several ways to spatially-localize music and audio content within a binaural audio delivery system. However useful binary audio may be for VR audio design, binaural also has some logistical drawbacks for the consumer. Let’s take a look at those, and examine some solutions that have been proposed. In today’s modern high-tech environment, smart devices are everywhere. One of the defining characteristics of a smart device is its ability to identify itself when used in combination with other technologies. Smart devices are essentially plug and play. We can plug a smart device such as the famous iPhone into a computer, and the computer will immediately know what it is. Lots of peripheral devices are instantly recognizable, such as keyboards, game controllers, hard drives, etc. Most standard headphones, however, aren’t smart devices. When we plug them into a computer for use with a VR system, the system won’t be able to identify the headphone model, nor will it be able to detect any onboard signal processing such as noise cancellation or spatial rendering (surround sound or binaural). That means that the VR system can’t automatically compensate for the headphone technology currently plugged into it. This is where things can go wrong. What if a pair of surround-sound headphones are plugged into a VR gaming device outputting in binaural sound? The VR game’s binaural audio is going to get spatially reprocessed by the headphones, resulting in a serious degradation of the sound quality. Consumers are accustomed to their devices communicating with each other and sorting these sorts of issues out autonomously. If the VR system is smart, but the headphones are essentially dumb, what then? So, in an ideal world, the VR system would be able to identify the nature of the headphones and adjust its output accordingly. We can all hope that smart headphones will eventually appear on the high-tech horizon, but what about the other end of the equation? Can VR audio systems provide multiple audio mixes for different types of headphones? Aristotel Digenis proposes a way in which this can be achieved… although it includes the use of a new audio format, and a dramatic re-evaluation of the way in which VR audio is currently delivered. First announced in 2013, the MPEG-H 3D Audio coding standard supports multiple audio channel output configurations including binaural rendering and higher order ambisonics. One of the advantages of MGEG-H is its compatibility with multiple audio playback systems, from simple stereo, to complex surround configurations, to interactive virtual reality audio systems. This flexible delivery mechanism, which the designers have coined Universal Delivery, allows the MPEG-H format to be cross-compatible with any type of listening equipment, from simple stereo headphones all the way to the most sophisticated home theater setups. In other words, MPEG-H would allow VR audio to work on any playback system instead of its current limitation to headphones alone. Currently, the developers of MPEG-H are concentrating their focus on TV broadcast applications. Here’s a short video demonstration of the television use of MPEG-H. Notice how the audio content remains interactive on a highly detailed level, allowing the manipulation of individual sonic elements by the end-user. While it seems like the MPEG-H format is a long way from practical implementation in VR applications, it shows some promise in providing future options for game audio folks working in VR. We can imagine a future in which a virtual reality game may have its audio recorded and mixed in ambisonics, and then output in any number of configurations depending on the nature of the sound playback system. In my upcoming GDC talk, I’ll be discussing the role of ambisonics in game audio development, starting with a historical overview and moving to the importance of the format in modern VR games. Creating more opportunities for ambisonics to flourish in VR audio is an interesting topic to consider. Let’s examine one intriguing possibility. Ambisonic orchestral recordings are not often encountered in VR games, but they’re becoming a bit more common in other forms of virtual entertainment. As a way to imagine how ambisonic orchestral recordings might be deployed in future VR games, let’s take a look at an experiment undertaken by the Institute of Communication Systems at RWTH Aachen University in Germany. In April of last year, the Institute began a cooperative venture with the Aachen Symphony Orchestra. Over the course of several months, the orchestra was recorded with an em32 Eigenmike microphone array, which is capable of recording 32 channels of audio for fourth-order ambisonics. They placed the microphone in the middle of the string section, and also positioned a 36o° camera at the microphone array location so that a VR video could be made. The result replicates the experience of sitting right in the middle of the orchestra during a live concert. The Institute of Communication Systems reports that “the recorded content will be used for future research activities in the area of audio signal processing for immersive audio systems, e.g., 3D audio formats, binaural signal processing and spatial audio playback.” So these experiments may yield results that prove to be useful to game music composers working on VR projects. Here’s a video of one of the recorded performances of the Aachen Symphony Orchestra. Remember to wear headphones when listening, and feel free to swing the camera view in all directions! In my past two articles, I’ve shared some of the additional research I’d encountered that didn’t make the cut for my GDC 2018 presentation, ‘Music in Virtual Reality‘ (Thursday, March 22nd at 3pm in room 3002 West Hall, Moscone Center, San Francisco). The presentation I will give at GDC 2018 will include lots of practical and concrete techniques and strategies for video game music composers and audio folks looking to implement music strategically and effectively within VR. That being said, the more general research and techniques in these two articles can also provide helpful insight. I’ve included the official GDC description of my upcoming talk below. Please feel free to share your thoughts and insights in the comments section at the end of this article! This lecture will present ideas for creating a musical score that complements an immersive VR experience. Composer Winifred Phillips will share tips from several of her VR projects. Beginning with a historical overview of positional audio technologies, Phillips will address several important problems facing composers in VR. Topics will include 3D versus 2D music implementation, and the role of spatialized audio in a musical score for VR. The use of diegetic and non-diegetic music will be explored, including methods that blur the distinction between the two categories. The discussion will also include an examination of the VIMS phenomenon (Visually Induced Motion Sickness), and the role of music in alleviating its symptoms. Phillips’ talk will offer techniques for composers and audio directors looking to utilize music in the most advantageous way within a VR project. Through examples from several VR games, Phillips will provide an analysis of music composition strategies that help music integrate successfully in a VR environment. The talk will include concrete examples and practical advice that audience members can apply to their own games. The talk will be approachable for all levels (advanced composers may better appreciate the specific composition techniques discussed). 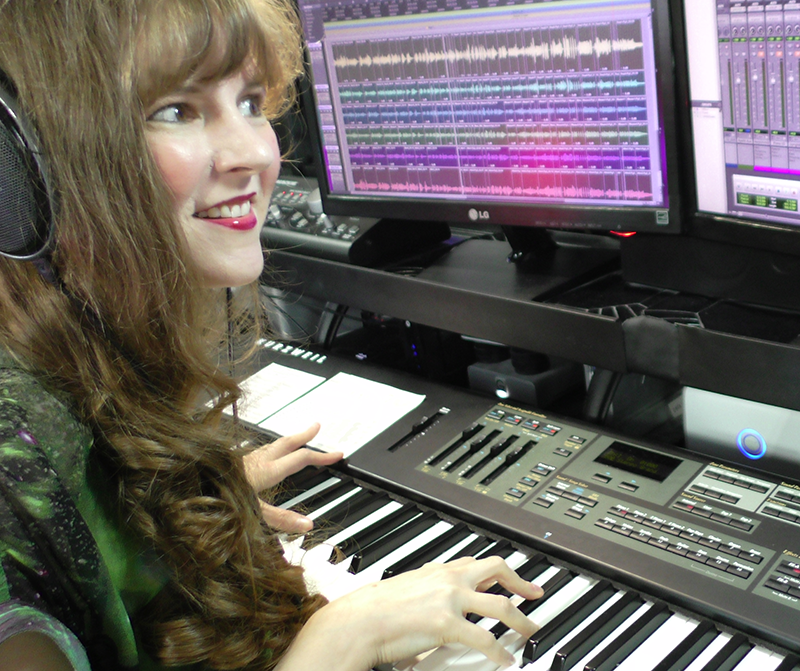 Winifred Phillips is an award-winning video game music composer whose most recent projects are the triple-A first person shooter Homefront: The Revolution and the Dragon Front VR game for Oculus Rift. Her credits include games in five of the most famous and popular franchises in gaming: Assassin’s Creed, LittleBigPlanet, Total War, God of War, and The Sims. She is the author of the award-winning bestseller A COMPOSER’S GUIDE TO GAME MUSIC, published by the MIT Press. As a VR game music expert, she writes frequently on the future of music in virtual reality games. Follow her on Twitter @winphillips. This entry was posted in Conferences, Game Audio, Game Music, headphones/headsets, Music, Music Composition, Software, Virtual Reality, YouTube and tagged ambisonics, binaural, game composers, game developers conference, GDC, Head Related Transfer Function, headphones, HRTF, MPEG-H, smart devices, video game composers, video game music. Bookmark the permalink.